It is very important to seek early treatment if any of the symptoms of tarsal tunnel syndrome occur. If left untreated, the condition progresses and may result in permanent nerve damage. In addition, because the symptoms of tarsal tunnel syndrome can be confused with other conditions, proper evaluation is essential so that correct diagnosis can be made. 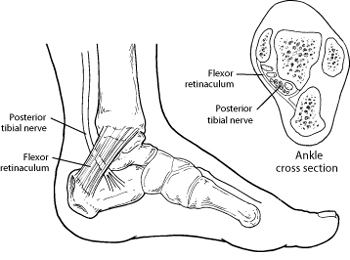 A person with flat feet is at risk for developing tarsal tunnel syndrome, because the outward tilting of the heel that occurs with “fallen archesarches" can produce strain and compression on the nerve. vein, vein, ganglion cyst, swollen tendon, and arthritic bone spur. The foot and ankle surgeon will examine the foot to arrive at a diagnosis and determine if there is any loss of feeling. During this examination, the surgeon will position the foot and tap on the nerve to see if the symptoms can be reproduced.He or she will also press on the area to help determine if a small mass is present. Sometimes an MRI is ordered, usually if a mass is suspected or in cases where initial treatment does not reduce the symptoms. In addition, special studies used to evaluate nerve problems — electromyography and nerve conduction velocity (EMG/NCV) — may be ordered if the condition shows no improvement with non-surgical treatment.tment. Ice. To reduce swelling in the tarsal tunnel, apply a bag of iceover a thin towel to the affected area for 20 minutes of each waking hour. Do not put ice directly against the skin.